Blogging is something I do in my spare time, so when free moments are a rare commodity, it’s nearly impossible to carve out quality time to rant/rave about Star Wars/Trek. So if you thought I’d vanished two weeks ago, rest assured that my absence was due to a busy schedule and not spontaneous human combustion. Thor: The Dark World wasn’t that good. What have I been busy with? Well, let’s just say I’ve been collaborating with a certain WWE icon whose rubbed elbows (and feathers) with everyone from “Mean” Gene Okerlund to Koko B. Ware since he debuted live on pay-per-view 23 years ago. In all honesty, I’ve worked with better … but not many. Watch WWE’s latest video series below, starring sports-entertainment’s most polarizing ornithological oddity. Marvel Studios is coming dangerously close to spoiling us. 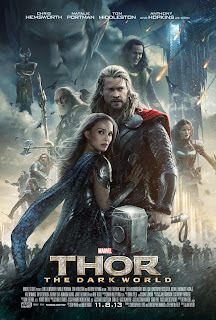 At a point when most franchises are seriously running out of steam, The House of Ideas has given us Thor: The Dark World, the eighth film to take place in the Marvel Cinematic Universe. It’s technically a sequel to 2011’s Thor but, more than, that, this is the proper follow-up to The Avengers we all hoped Iron Man 3 would be. But just how good is it? Well, I’ve seen it twice already, and I wouldn’t be surprised if I saw it a third time before it bows out of theaters. No, I’m not ashamed to admit that. I’m clearly not alone in my appreciation for this surprisingly entertaining sequel, which has reportedly pulled in more than $86 million domestically. Think about that for a second. Did anyone really care all that much about Thor before 2011? Now, the hammer-swinging demigod has emerged as a pop-culture icon, his story made far more interesting on film than it had been over the past several decades in print. For example, remember Thunderstrike? No, you don’t remember Thunderstrike. As noted previously by my pal Kevin Powers over at Comic Odyssey, part of the appeal of The Dark World is that it never stops feeling like a comic book. Director Alan Taylor (Game of Thrones) balances the heavy stuff — including at least one major character’s death — with some welcome moments of levity. Pants are misplaced. Bad guys are smacked around with hilarious ease by our flaxen-haired hero (Chris Hemsworth). Even Loki (Tom Hiddleston) gets a few laughs this time around as the audience tries to figure out whether his decision to assist his brother against the evil Dark Elf Malekith (Christopher Eccleston) is a genuine one. Kat Dennings continues to steal scenes as Darcy Lewis, Dr. Jane Foster’s intern who, for some reason, has acquired an intern of her own. As for Jane herself, Natalie Portman steps back into the role with ease, flip-flopping from hard-nosed scientist to lovelorn teenager depending on whether or not she’s in the presence of her godlike kinda-sorta-boyfriend. Even Odin (Anthony Hopkins) cracks a smile or two. There’s a pervading sense of fun throughout The Dark World’s brisk 112-minute adventure, which is appreciated when so many other blockbusters — including this summer’s Man of Steel — can be too serious for their own good. Sating audience’s desire for action on a massive scale after the city-smashing finale of The Avengers, The Dark World doesn’t skimp on fight sequences, something its 2011 predecessor was sorely lacking. The physics-defying finale in London is particularly satisfying, with our heroes battling Malekith and his Dark Elf minions across dimensions as the fate of the universe hangs in the balance. Spoiler alert: Things work out okay. After all, we’ve got Captain America: Winter Soldier, Guardians of the Galaxy and The Avengers: Age of Ultron to look forward to, and that’s just over the next two years. Jaws might have been the first summer blockbuster in 1975, but it was George Lucas’ Star Wars films that made big, loud movies a time-honored tradition during the hottest months of the year. However, Disney and Lucasfilm are balking at that popcorn-munching ritual in 2015, and will be bringing us the seventh installment of the Star Wars saga on Dec. 18 of that year. As confirmed by StarWars.com, Episode VII will be the first film in the franchise with a winter release date. The later-than-expected opening might lead many to believe that the Star Wars sequel is experiencing some production woes, but I think it’s more likely that Disney’s putting forth a concerted effort to make this upcoming trilogy, you know, good. Production on Episode VII will begin this spring. For the full story, click here.